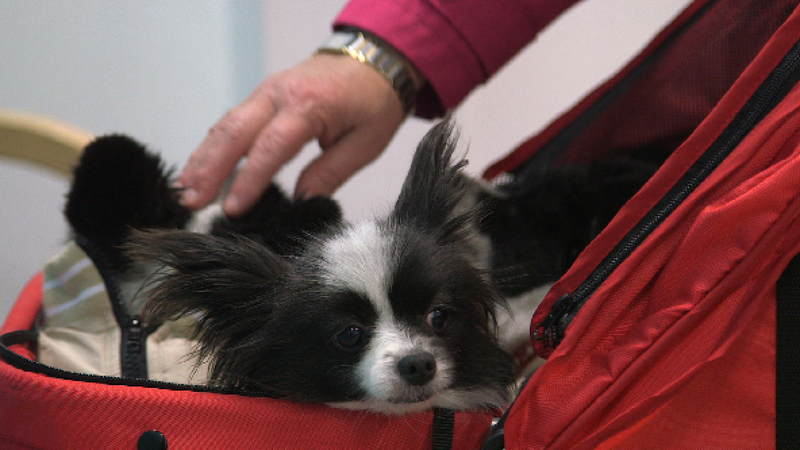 Caroline arrives at Fitzpatrick’s with fourteen of her rescue dogs, including Cookie, a tiny 4-year-old Papillion. Cookie has developed polyarthritis that has destroyed the cartilage in her elbows. Noel offers Cookie a double total knee replacement – the smallest he has done yet. Cookie lives with mum Caroline and her 14 brothers and sisters - all rescue dogs. We see hundreds of people who are dedicated to their animal family, but every now and then someone truly extraordinary and special comes to the practice. Caroline arrived at Fitzpatrick Referrals with 14 of her rescue dogs including 4-year-old Papillion Cookie, a lady truly devoted to her extremely large canine family. Caroline took in her first rescue dog when an accident forced her into an early retirement. She now has quite an extended family with seventeen rescue dogs in total! Caroline had had tiny Papillion, Cookie, for three years when she noticed that Cookie was not herself and seemed to have trouble walking and getting around on her feet. Her local vet diagnosed her with Polyarthritis, an arthritic condition that can affect multiple joints, which had destroyed the cartilage in Cookie’s wrists. Cookie had surgery with her local vet to fuse them solid, but now, after two years, the arthritis is badly affecting her knees and Cookie can barely stand. Caroline came to see Professor Noel Fitzpatrick with the hope he may be able to operate on Cookie’s knees and get her out of pain. Noel gave Cookie a thorough examination and found that both of her knees were unstable with bone grating against bone, which was causing Cookie significant pain. 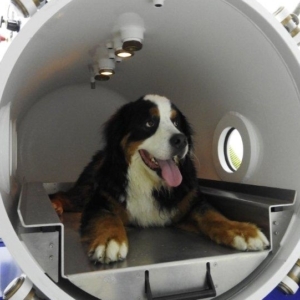 Noel ordered a CT scan to better see the extent of the damage to Cookie’s tiny knees and, unfortunately, it confirmed what Noel suspected; both knees were severely affected. The protective cartilage layer that would usually allow a cushioned, pain-free joint to function had been eaten away by the disease, causing her femur and tibia to rub against one another. Noel explained to Caroline that a knee replacement would be possible but that it is a significant surgery and that if it failed, she would face little choice other than euthanasia. To Caroline it was a simple decision, she had to do what she could for her little friend and asked Noel to go ahead with the double knee replacement. Cookie is one of the smallest knee replacements Noel has ever done and, with that, he has had to design and manufacture the smallest custom-made titanium implants he’s ever attempted. To save Cookie the strain of two surgeries, Noel opted to do both knee replacements at the same time. Once in surgery, Noel set about readying her femur and tibia before carefully inserting the tiny implants in perfect alignment. The implants are held in place with a combination of screws, wire and surgical cement, which sets in just a few minutes so Noel has to work quickly under immense pressure. Finally, after 4 hours of surgery, Noel had successfully replaced both of Cookie’s knees. Cookie remained at the practice for a number of weeks during her recovery for intensive physiotherapy and hydrotherapy. During that time she made quite an impression on the Fitzpatricks staff as either a feisty menace or charming princess – depending on whether she took a shine to you or not! Unfortunately, despite some success in hydrotherapy, Cookie was still finding it difficult to walk as the ligaments in her ankles had become stretched. Noel took Cookie to theatre for a second time and used strong nylon thread to act in place of the ruptured ligaments. Over time Cookie’s body would reinforce the repair with scar tissue to support the joint long-term. Cookie remained in hospital for ongoing rest, physiotherapy and hydrotherapy. The next few weeks saw Cookie grow stronger and eleven weeks later she was finally able to go home with Caroline and her large family. Cookie did very well for a number of months but sadly the Polyarthritis progressed at an accelerated rate and started to affect further joints. Noel and the team decided that it would not be morally right to put her through more surgery and so Caroline is now managing Cookie’s condition medically to keep Cookie free from pain and enable her to enjoy a good quality of life. 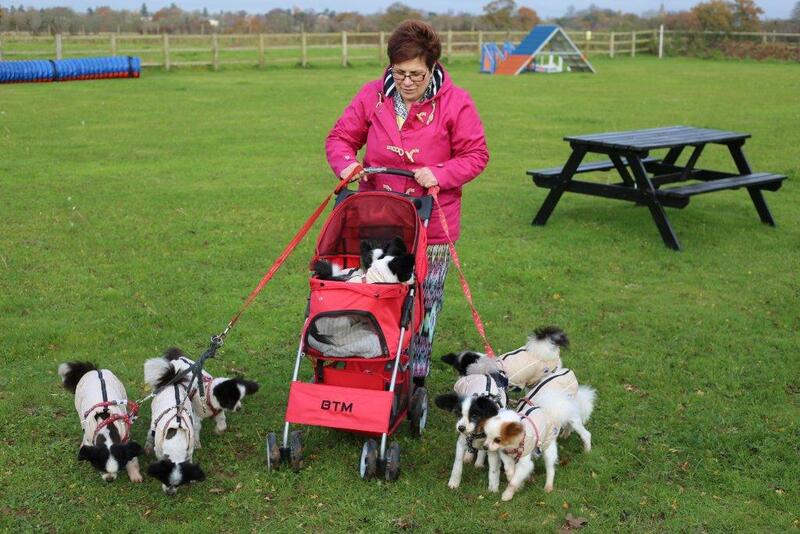 We feel honoured to have met Caroline who is a really lovely lady who dedicates her life to the happiness and wellbeing of her dogs.